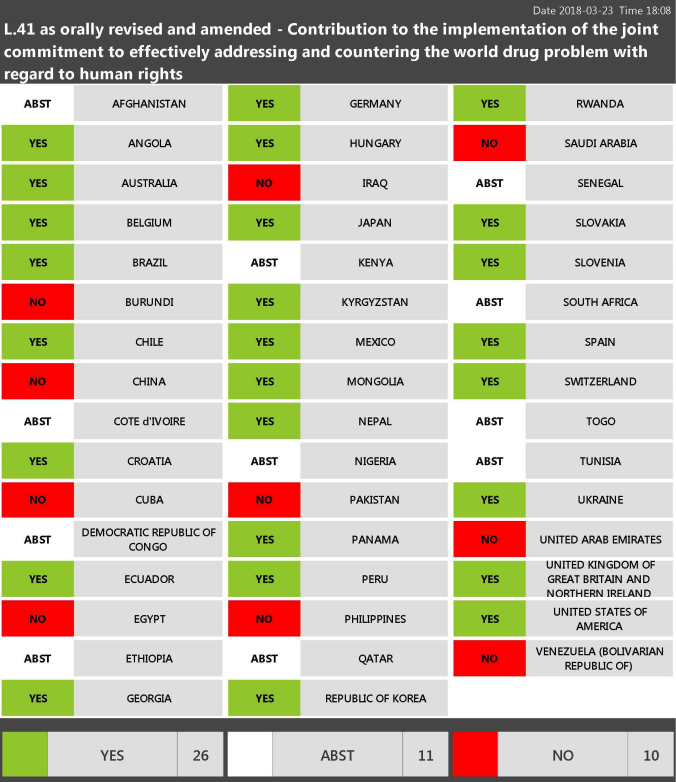 Member States votes on the « drug policy » resolution L41 during the 2018 session of the Human Rights Council. Besides, the High Commissioner for Human Rights is reinforced in his mandate to poke his nose in the so-called « world drug problem » and to evaluate the human rights implications of the drug policies that have been enforced during the past decade. Everything began with the work of the Office of the UN High Commissioner for Human Rights, when preparing their Contribution to the UNGASS 2016 summit. Broad consultations were undertaken among Member States, UN agencies, international organizations and NGOs from around the globe (read here all the submissions), resulting in a report titled « The impact of the world drug problem on the enjoyment of human rights« , targeting for the first time the huge cross-cutting issues and tensions between both thematic areas. More recently, the OHCHR took the initiative, in its global update about human rights concerns in the planet, to « urge[s] all States to examine the effectiveness and human rights impact of their current approaches to the so-called ‘War on Drugs’« . The 12th of March, for the opening session of the CND, the theme of Human Rights was heavily introduced by a video statement from UN Chief: Antonio Guttierez, the UN Secretary-General, called for « efforts to stop organized crime while protecting human rights, enabling development, and ensuring rights-based treatment and support », and took the opportunity to recall that he had been the main instigator of the decriminalization of drug use in Portugal, in the early 2000’s (a policy that has shown its effectiveness in more than 15 years of enforcement). A few months ago, in June 2017, just after taking office, Guttierez already reminded that it was « vital [to] examine the effectiveness of the War on Drugs approach, and its consequences for human rights ». During this year’s CND as well, the UN Development Program (UNDP) recalled the commitment of countries to « ensure that drug control efforts be conducted in full conformity with the aims and principles of the Charter of the United Nations and the Universal Declaration of Human Rights ». Moreover, UNDP concretely proposed the creation of international guidelines on human rights and drug control, ensuring that such guidelines would « help provide guidance on how to systematically integrate a human rights framework into international drug control » and « strengthen accountability » among other. Watch the video of the conference « Hierarchy of norms between drug control and human rights » with Pr Masha Fedorova (Radboud Univ. ), Dr. Rick Lines (Essex Univ.) and Robert Husbands (UN Human Rights). Last but not least, the International Narcotics Control Board (INCB) also started on the path to mainstreaming Human Rights considerations in their approach. The INCB calls itself the « guardian of the drug control Conventions » and has been known for its narrow reading of international law, sticking to a drug control system that would only be framed by the 3 drug-Conventions. Still, their annual report presented the 1st of March, ahead of the 2018 CND, dedicated a « Special topic » to this question, taking note of the 70th anniversary of the Universal Declaration of Human Rights. They confirmed what we exposed last year in a conference held during the 2017 CND: hierarchy of norms often puts Human right obligations over and above drug control conventions, and bind countries to take steps that mitigate the impact of drug laws on Human Rights (including, as explained in the video, decriminalizing the use, or regulating safe access for medical purposes, and for recreational purposes under certain conditions and in certain cases). Following the steps of Guttierez, the president of INCB Dr. Viroj Sumyai « call[ed] upon all States to adopt drug policies that respect the rule of law, the principle of proportionality and human rights« in its opening address to the CND. Unexpectedly, the head of this historically most conservative international drug control entity directly challenged the world governments, stating that « during this session of the Commission, and in [their] resolutions, [they] also have the opportunity to reaffirm that actions taken in accordance with the spirit and letter of the international drug control conventions must also be consistent with international human rights standards and norms« . This unfortunately remained as nothing more than a pious hope, as the CND – we saw it – did not manage to agree on anything in that direction. But that was until March 2018. Now, the « world drug problem » finally concerns and commits the whole UN family. Now, the global drug policy discussions will finally incorporate the broad diversity of disciplines and mindsets that its complexity calls for.